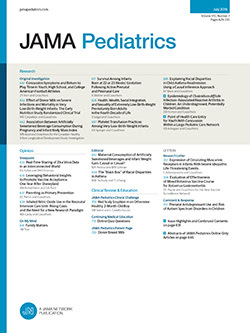 An 8-year-old boy from Botswana was referred to a tertiary-level center with a 1-day history of fever, dry cough, headache, shortness of breath, and chest pain. One month prior, he had a similar episode and was treated for a left-sided pneumonia. A chest radiograph at the time revealed a homogenous opacification in the left lower zone. He was otherwise healthy; human immunodeficiency virus testing results were negative. On admission, the child was ill-appearing, febrile (38.9°C), tachypneic (respirations, 53/min), and hypoxic (percutaneous oxygen saturation, 93% on room air). A pulmonary examination revealed mild subcostal retractions and decreased air entry in the left lower zone with dullness on percussion. Chest radiography (Figure 1) showed an encapsulated structure in the left lower zone with an air-fluid level. Abdominal computed tomographic scan detected a single well-defined cyst in the right lobe of the liver. On day 3 of admission, he developed acute respiratory distress and was unable to complete a sentence. Examination showed tracheal deviation to the right with resonance and absent breath sounds over the left lung field. A repeated chest radiograph (Figure 2) revealed a left-sided tension pneumothorax. Chest radiography on presentation showing an encapsulated structure (arrow) in the left lower zone with an air-fluid level. Chest radiography was repeated following the development of acute respiratory distress and revealed a tension pneumothorax (arrow pointing at an absence of lung markings on the left side of the chest). L indicates left.